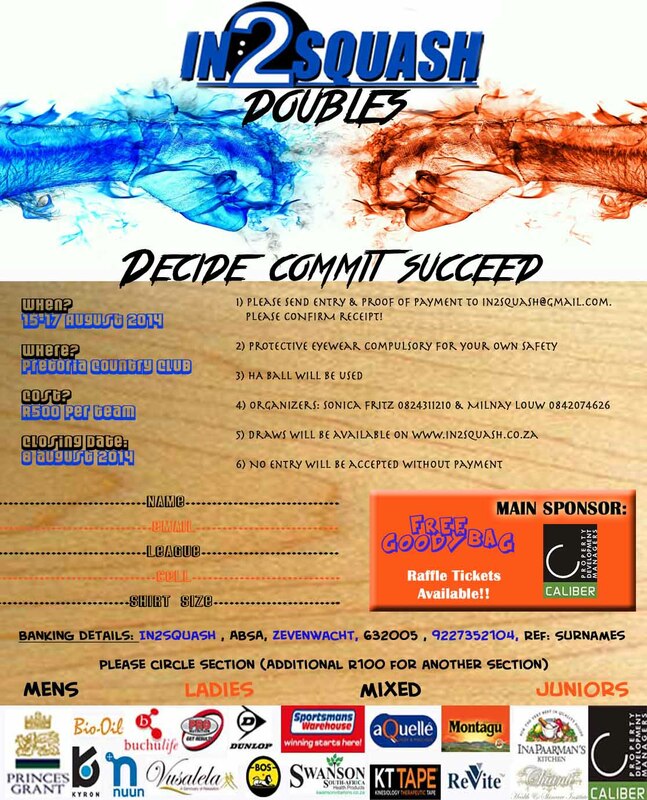 We are very proud to announce the next In2squash Doubles event! Thank you so so much for all the sponsors that committed! This is really amazing! Prizes will range all the way from a break away to Prince’s Grant, lots of different products, massages, you do not want to miss out on all the action! This event is open to players of all levels! Sonica Fritz and Milnay Louw will be hosting this event at Pretoria Country Club 15-17 August 2014. There will be a special raffle draw for the first 30 teams that enter the event! Do not wait for the last minute to enter and stand a chance for an extra prize! It will be much appreciated if you can please forward this email to all squash players and if possible put the entry form up at your home club! A massive thanks to the sponsors! PLEASE SUPPORT these companies, without their support this tournament will not be possible! We have a special sponsorship page on our website to give you more information about all companies.